An effective visual information system says: “Let me help you get to your destination”. Visual information system (VIS) is a necessary and enriching aspect of the image of functionality of each complex object or on a larger scale of urban space. VIS elements such as signposts, information boards, maps, guides, pictograms and other determine the place and suggest the direction in which we should move and indicate the relevant information. Visual information system is used in shopping malls, airports, railway stations, hotels, swimming pools, parking lots, commercial buildings and public buildings. We design and develop systems corresponding to the style of the objects, which they will be installed in. We use the latest technology of processing and printing, we combine materials such as steel, aluminium, glass, plastic, wood and stone, we care about the visual effect and the content. Comprehensive service in the field of design and production systems of visual information, "digital signage" systems and information graphics. 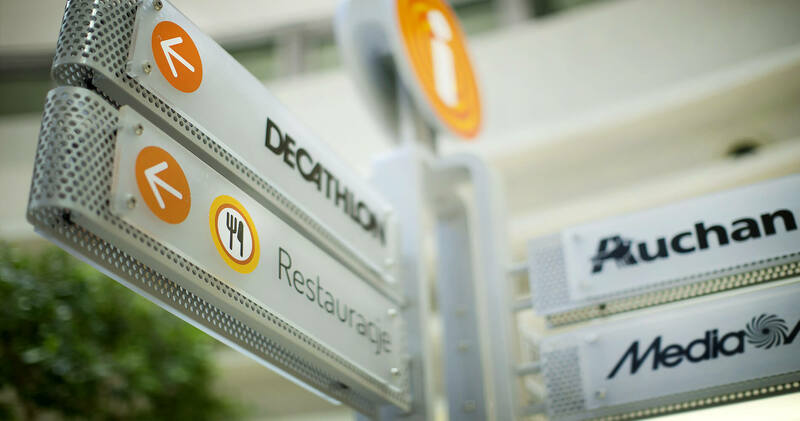 We create unique projects of markings in hotels and wellness centres, our main objective is to create simple clear designs, which will also be attractive to your guests and will allow them to get to the right place. We specialize in reconstructions of shopping malls and hypermarkets. Our biggest advantage is experience in rebranding and the possibility of production of all design elements in our own machine park, so that we are able to meet the most demanding projects.